General Math - Many Resources for all Grades, including: Links to Large Math Sites, Interactive Math Activities, Lesson Plans, Webquests, Converters, Calculators, Virtual Manipulatives, Prime Number Generators, Fractions and Ratios, Worksheet Generators, Word Problems, Tables and Formulas. Suitable for Grades K - 12. Elementary Math - Covers Basic Subjects, Including Whiteboard Resources, Online Quizzes, Projects for 100th Day of School, Online Activity Links, and Printable Tests and Worksheets. Secondary (Middle/High School) Math- Covers Basic Subjects including Algebra, Calculus, Trigonometry, Geometry, History of Math, PowerPoint Unit Topics, Lesson Plans, Scatter Plots, Spreadsheets and Graphing Calculators. Special Topics - Math Activities related to: Number Sense, Concepts, and Operations, Fractions, Measurement, Spatial Sense, Data Analysis, Probability and Algebra. For grade level online math activities to prepare for testing, visit our Assessment Assistance Pages. 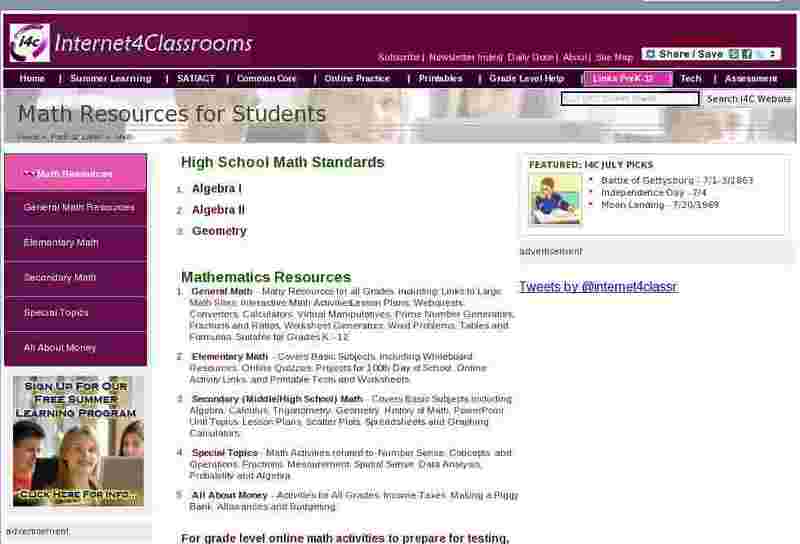 For grade level online math activities, visit our Grade Level Practice Pages.